This place is quirky, eclectic and like a biblical woman during that time of the month, UNCLEAN. Situated on a lonely stretch of Pico, next to a 7-11, Golden Indian Grill & Pizza (of course the two go together) was kind of a last minute decision. Upon entering, we notice a disheveled, lady of the evening counting her lotto tickets and marking them on a spreadsheet. Proving that a little organization in advance can save you a lot of unnecessary hassle later, when you attempt to cash in hundreds of crumpled, expired, losing tickets. The pizza was actually kind of tasty. 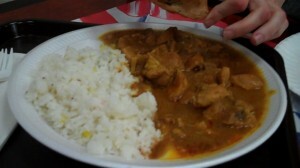 The curry however…one word…instant diarrhea. It’s one word if you say it fast enough on your way to the bathroom. The pictures on the wall were the highlight of this culinary journey. 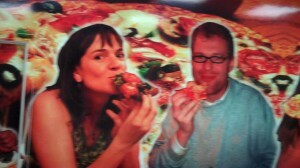 There were four enourmous photos (one with red eye) of random people shoving pizza in their tomato sauce-stained mouth. Not pizza models. But real, disposable photos of weird, squinting strangers all eating a completely different brand of pizza. Hilarious. We served ourselves water from the .99 cent store plastic pitcher from the deli fridge. For dessert, we had some weird Indian yogurt popcicles that were not bad. But like with the curry, my stomach grumbled just looking at the previously melted and refrozen treats.